Blackheads, the small dark spots on your skin, are also known as ‘open comedones,' whereas whiteheads are ‘closed comedones.' Blackheads are, in fact blocked pores that become filled with keratin, skin debris, and sebum, your body's natural oil. This marks the first stage of pimples or acne formation. Although they aren't an actual health threat, blackheads can be quite annoying since they appear on the most noticeable part of your body — your face. Generally, they appear on the nose, which can be really unattractive. So, if you want to get rid of this pesky skin issue, it's important to know how to deal with it safely and quickly. Unfortunately, there is no traditional method to remove blackheads. Although, there are face creams and solutions, these can just eliminate the scars left behind. There are, however, excellent home remedies that can perform miracles on your skin. What's best about them is that they're completely natural with no side effects. You can make an egg white mask to treat your pores. 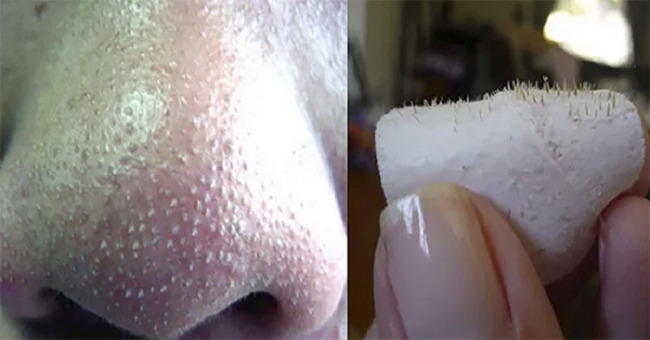 This mask will not only remove blackheads on your nose, but it will also stop possible future outbreaks. Abundant in nutrients, egg whites are great for your skin. Apply the egg white on your skin in a thin layer. Put the toilet paper or facial tissue on the white portion pressing your face gently. Leave it for some time until the layer dries. Now apply a second layer over the paper or tissue; these shouldn't slide. Leave it some more time until this layer dries too. Optionally, you can also apply a third layer. When your mask is dry, your face will feel tight. Peel off the mask, and get rid of any residue. Pat your face dry. Apply some moisturizer. Cinnamon and honey is a very powerful combination due to the high content of anti-bacterial agents in honey which guard against acne-causing bacteria. Plus, this treatment will remove anything clogging your pores. Cinnamon, on the other hand, stimulates circulation. In the end you will get radiant, healthy, smooth, and blackhead free skin. Blend the cinnamon and honey together. Apply a layer on your blackheads, keeping the layer thin. Press a cotton strip over it. Leave it for three to five minutes. Remove the strip and wash your face. As lemon juice is abundant in certain vitamins and nutrients that are highly efficient against blackheads, this scrub is great for this skin issue. Mix the honey, yogurt, salt and lemon juice. Applying the mixture evenly, scrub the affected area on your skin. You can also make a facial cleanser by mixing rosewater or milk with lemon juice. Use this treatment every day, for up to 10-12 days. It's widely known that green tea is great for your health in so many different ways. Not only can it improve brain function, but it can also stimulate weight loss, reduce the risk of various types of cancer, lowers the risk of Parkinson's and Alzheimer's, improves dental health, and fight type 2 diabetes. Plus, green tea is amazing in treatment of blackheads. Put dry green tea leaves in a bowl. One tablespoon should be enough. Create a paste by mixing these two. Rub this paste over the blackheads for 2 to 3 minutes. Pat dry with a soft towel or napkin. This scrub is excellent for deep cleaning oily skin and unclogging pores.